How to tell if you have been invited to a hipster wedding is one of those social survival skills that will keep you from looking like an idiot when you show up. 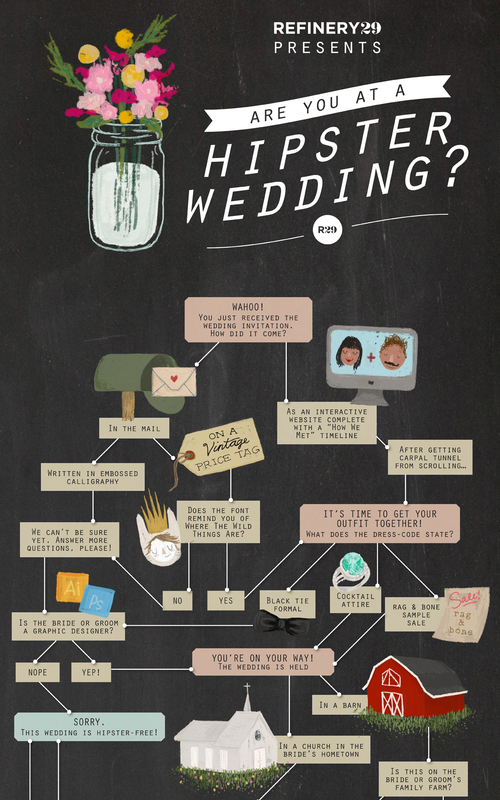 This handy info graphic will lead you through the steps to tell if your wedding, or the wedding of a friend is headed to hipsterville. Of course not all rustic weddings are hipster inspired. The original infographic is originally from refinery29.com but I couldn’t find the page. You know you’ve made it mainstream when Wikihow writes about you. But is their diluted tutorial really all it takes to become a Seattle hipster? Now you can find out exactly what type of Seattle Hipster you are with this handy quiz. Admit it, you thought you had seen everything didn’t you. Maybe my man bun needs some shade?